Happy birthday, Reverend Dodgson! Barring George Herbert’s “Easter Wings“, this is probably the earliest example of concrete poetry in English. It is rather amazing how many of the 20th century’s art and literary movements Carroll either influenced or foresaw — dada, surrealism, futurism, pop art, postmodernism, absurdism. The term “concrete” wasn’t coined until the 1950s, when the de Campos brothers of Brazil wrote its manifesto and pioneered the form. Tennyson once told Carroll that he had dreamed a lengthy poem about fairies, which began with very long lines, then the lines got shorter and shorter until the poem ended with fifty or sixty lines of two syllables each. Tennyson forgot the poem when he awoke, which is a shame, because I’d love to read it. 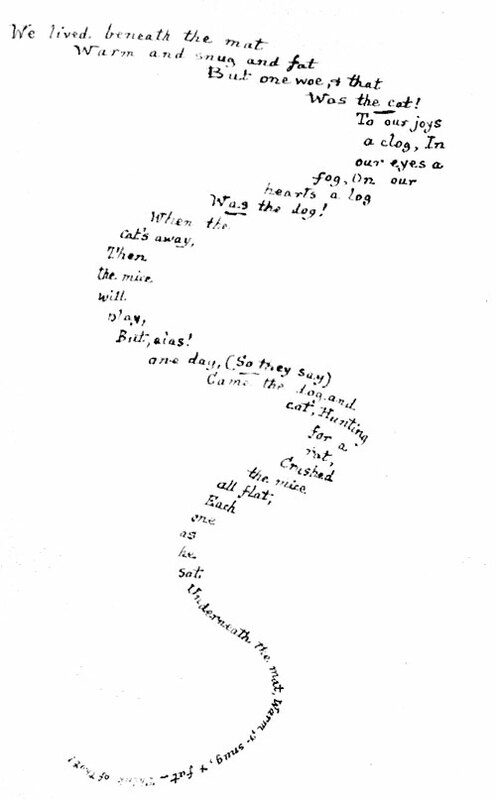 Below is an early version of “the Mouse’s Tale” written out by Carroll, a tail that doesn’t end in death. You are currently browsing the Lewis Carroll category at Ondioline.